The Personal Barber has launched which means every month we send out a new box to our subscribers filled with the finest wet shaving products available. Signature classic safety razor – All first time subscribers get a safety razor in their first box so they can jump straight to it. Our razor is very forgiving, with a relatively small blade gap (this is the amount that the blade is exposed and determines its “aggressiveness”) making it ideal for the beginner wet shaver. It also has a much lighter head to prevent too much pressure being applied. 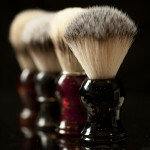 Synthetic hair shaving brush – All first time subscribers get a shaving brush in their first box. The use of high quality synthetic hairs makes it easy to load with soap (the act of getting shaving soap into the brush for lathering) as well as being very soft on the skin. Shaving Soaps – There are two brands of shaving soaps included in the February 2015 first shaving box. Both are handmade from small independent producers using only natural ingredients. The first soap is from Sea Drift; it is unscented and is made to provide a deep clean to your face. It is good for those wanting to use a soap that won’t clash with the smell of their aftershave or balm. The second soap is from Mutiny and has a really refreshing and strong scent of lime and lemongrass that really picks you up in the morning. It’s not so strong that it is overpowering but leaves a very subtle hint after use that can be left alone or used to enhance a citrus based aftershave or balm. Alum matchsticks – These sticks are really convenient. Simply moisten the tip and then run over any cuts or irritation, it is an astringent that constricts the blood vessels preventing bleeding. Replacement blades – The type of blade you use plays an important role in shaving as each brand has different levels of sharpness. Put simply, a very sharp blade is good for cutting cleanly through the hairs of particularly hirsute individuals as it won’t tug. However the sharper the blade that you use the more risk there is of causing irritation so it is best to use a blade that isn’t too harsh for your skin. 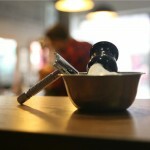 It is important to find the brands that are right for you for a more comfortable shaving experience. 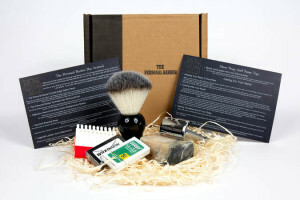 In the box there are two brands included, Derby Extras and Wilkinson Sword. Derby Extras are a relatively dull blade which makes them ideal for those with soft fine hairs or sensitive skin. Wilkinson sword is a medium sharpness blade but with a special chromium coating that is supposed to make it easier to glide across the face. Both are excellent brands and it is worth seeing if you can tell the difference between them. 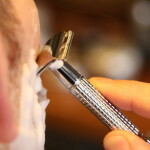 Over time you will learn to choose the right blade for your skin and hair type. 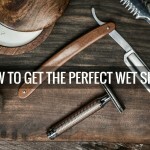 TPB Cards – Also included in this month’s box is a step-by-step shaving guide to initiate the first time wet shaver and set him on the path to smoothness as well as a care guide that outlines how to keep your new goodies in top notch condition. After each use it is advised that you let your soap dry out. This prevents it from turning too soft which would negatively impact its longevity. If you keep your soap in a bowl or mug, drain all the water and then leave open to dry until your next shave. After each use, rinse the soap out of the brush with warm water, flick dry and leave standing upright or hanging on a stand with the hairs pointed down. This prevents a build up of soap forming on the hairs which would impede its use. Do not pull the bristles. If you are squeezing out water, squeeze at the knot and don’t pull as brushes are not designed to take that kind of strain. Never press the brush so hard (such as when building lather in a bowl or on your face) that the hairs completely splay out. Through use occasionally hairs will fall out, particularly in the early stages, this is normal and caused by bristles that weren’t long enough to fully set in the epoxy that affixes them to the handle. Make sure to air dry your razor after each use by giving it a gentle shake to remove excess water and then leaving on an open surface. You can also pat it dry with a clean towel if you fancy. 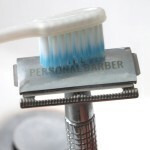 No need to take the blade out after each shave, it can be safely stored in the head between each use under normal usage. Never leave a blade in the razor head for longer than a week or two as it can rust which can in turn damage the finish of the razor. At The Personal Barber we try to minimise our damage to the environment through the materials we use to send you your shaving goods. Rather than using plastic bubble wrap to keep your items safe, we use natural wood wool and we wrap this up in recycled black tissue paper to keep it looking smart. The cardboard box is recyclable too.